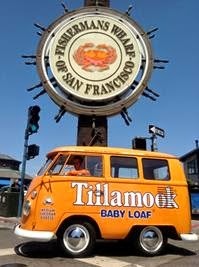 Frisco Kids: Coming Up: Tillamook Pop-Up Store - Free Food! Get some fun and tasty Tillamook samples this weekend, as Tillamook puts up a pop-up store in the Sunset. They'll be sampling cheese, ice cream, yogurt, sour cream and butter. But better yet - free hand-scooped ice cream cones and grilled cheese sandwiches. They'll have every one of their products available to taste. Saturday, they'll have local wine and beer pairings with cheese from 5-8 p.m. And Sunday at the same time, you can make your own ice cream sandwich, probably more kid-friendly than the other, but as we tell our kids, sometimes you have to do things for your parents. And that just could be affogato or wine/cheese. Tillamook is an Oregon farm-owned cooperative brand, celebrating its 105th birthday! When: June 13-15, from 9 a.m. to 8 p.m.